Father Joseph T. Poggemeyer was born in Québec Canada on July 10, 1964. His unmarried mother immediately put him into an orphanage (which she also did for his blood-sister who came along 13 months later) run by the Sisters of the Good Shepherd in Québec’s old city. Before he reached the age of three, he was adopted (along with his blood-sister) through Catholic Social Services by Jack and Catherine Poggemeyer, who lived in Curtice, Ohio. Jack having died of cancer when Father was seven, Catherine single-handedly raised her four adopted children. Father graduated from Genoa High School, and then moved to Ann Arbor to attend the University of Michigan. He graduated from U. of M. with a bachelor’s degree in liberal arts, concentrating in Applied Linguistics. He was hired as Production Manager with Servant Publications, a Christian publishing company for which he had worked during his college years. Success at the production work led him to seek an MBA at Eastern Michigan University. Halfway through the MBA program, he felt compelled to enter seminary for the Diocese of Lansing, Michigan. Catherine Poggemeyer died of cancer during Father’s first year of seminary. 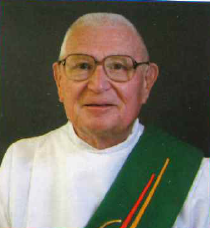 He then transferred to his home diocese of Toledo to complete seminary, and he was ordained in 1997, receiving most of his preparation for the priesthood from the Pontifical College Josephinum in Columbus, Ohio. 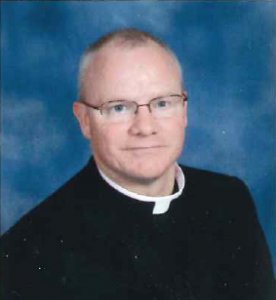 Father’s first assignment was as Associate Pastor at Sandusky St. Mary’s Parish. Most of his four years there were spent teaching full-time in the high school and serving as unofficial chaplain to some of the sports teams. At the end of his four-year term, the Diocese of Toledo loaned him to the Pontifical College Josephinum to serve on faculty. He studied in Rome from 2001-2005, receiving his licentiate and doctorate in biblical theology. Returning from Rome, he ran the college division of the Josephinum as Director of Formation from 2005-2008, and he taught biblical classes. He then returned to Toledo as Director of Religious Formation and Theology teacher at Central Catholic High School. This move came as the bishop needed somebody to become pastor of the Extraordinary Form Latin Mass parish of the diocese, St. Joseph’s Downtown Toledo. 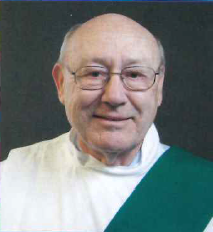 After a couple years, Father was asked to take over the newly merged parish of Saints Adalbert and Hedwig, leaving high school work, yet maintaining the pastorate of St. Joseph’s, which he has done for the past four years. Father is most grateful for God’s gift of the three popes who have led the Church during his adult life. Pope John Paul II taught beautifully on the mission of the Christian family in the world, and he gave us his Theology of the Body. Pope Benedict XVI gave us his motu proprio, opening up widespread celebration of the Extraordinary Form Latin Mass, and moving forward the Reform of the Renewal of Vatican II liturgy. He also taught us profoundly how to interpret the Bible, even giving us example with his three-volume work, Jesus of Nazareth. Finally, Pope Francis is sharing with us his charism for love of the poor and evangelization. Deacon Donald Coughlin married his wife Sue at St. Michaels Catholic Church in Hicksville. They have three children, Garry, Brian, Lisa and six grandchildren. Deacon Francis Koenn and Deacon Bob Nighswander were instructors in the Lay Ministry Program while he attended. During his 5th year of the program he had pastoral training in the hospital and it touched him in a special way and he rediscovered the power of prayer. He was ordained on June 9, 1990. As a deacon he performs many ministries but his main ministry is taking communion to shut ins and hospital visitations. He has also performed many baptisms, weddings, wake and funeral services along with annulments. 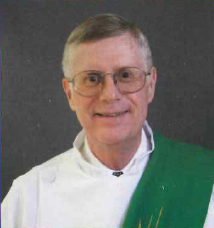 Deacon Dave Jordan was born and raised in Toledo and attended St. Agnes grade school, DeVilbiss High School and University of Toledo. He was a Navy medical corpsman for 5 years. He is married to his wife Darlene and they have two children, 5 grandchildren and 2 great-grandchildren. His hobbies are playing the guitar, reading, hiking and biking. He was ordained on May 20, 1995 and his calling to the Diaconate changed his life forever. He feels truly blessed by the many people in the parish that have touched his life. People are the focus of his ministry and though the years he performed many baptisms, weddings through his ministry. Deacon David Laker married his wife Janet and they have 5 children, 13 grandchildren and 2 great-grandchildren. He was ordained in July 10, 1982 and he feels one of the most important parts of our life is our family. He feels we need to be loving, kind, forgiving, compassionate and Christ-like. He has focused on Jail Ministry at CCNO for over 30 years and feels the importance of this ministry as he helps to build people back up, he also helps at weekend masses and takes communion to the sick and shut-ins. 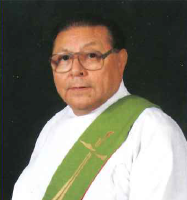 Deacon Rosalio Martinez was born in Union City, Indiana and was the oldest of nine children. He moved to the Paulding area and graduated from Paulding High School. He is known by two names, Rafael which is what his family and friends call him which he was named for his grandfather. At the age of 18 as he was applying for his social security card, he found the name Rosalio on his birth certificate which is what the parishioners of Divine Mercy call him. He is married to his wife Genny and they have two children, 2 grandchildren and one great-grandchild. His main ministry is taking communion to the hospital and nursing homes on Sundays. Deacon Robert Nighswander has been married to his wife Maxine for over 60 years and they have seven children, 11 grandchildren and 10 great-grandchildren who they enjoy spending time with. Bob was drafted into the Army from 1954-1956 during which time he completed a tour in Korea. Bob is retired from IT&T where he worked over 38 years as an engineer and supervisor. During his employment, he traveled to many countries throughout the world. 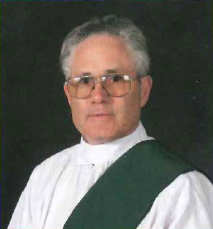 Bob was ordained a Deacon on June 1, 1974 and has baptized many children, instructed and officiated at marriages and helped people with annulments. He also helps at weekend masses and funerals.